I won this divine nail polish from Katie's blog RetroLove19 and boy do I love it! I have a soft spot for turquoise and teal shades at the moment and this shade was welcomed into my collection with open arms. In 'real life' this nail polish is slightly lighter. A photo will never do it justice though! 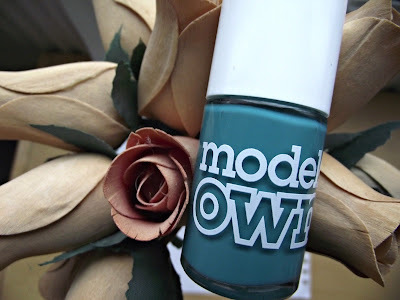 I really love Models Own Nail Polishes. They are opaque in 2 coats and have a great formula. They remove really easily as well. It does let me down on chipping though but with a decent top coat I can solve that problem. Their shade range is unbelievable as well and the glitters are just stunning. The polishes cost £5 and for a colour like this it is definitely worth it. That color is gorgeous! I've been really wanting a shade like that.